The Toys R Us Great Big Christmas Book, which offers savings and free gifts to those who purchase it, will hit mailboxes this weekend. Those who opt for the paper-free version can access the book on an Apple iPad in November or online at ToysRUs.com/ChristmasBook or on Facebook starting today. 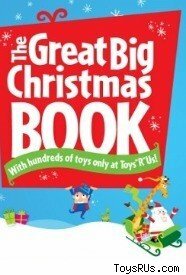 The Great Big Christmas Book contains more than 80 pages of toys and sales promotions right up until Black Friday. And, for the first time this year, Toys R Us will email even more toy deals throughout the holiday season to users who sign up on its website. If you have an iPad you can experience an enhanced digital version of the Great Big Christmas Book. The app will be available in the iTunes App store starting in November in the iTunes App store. The app is free as is the hard copy book, which is available in stores. The Great Big Christmas Book app has two modes - Children and Adult. The Children mode allows kids to look through the book, without prices, where they can drag toys to their must-have list. The Adult mode allows parents to view the toys on a child's list with price information, edit the toy wish list and even email the list to family members. The app allows for multiple children to create wish lists. These deals run from Oct. 31 through Nov. 24. Items with an asterisk (*) are available only in stores. These deals often represent some of the best of the season and can be combined with the recently announced 10% cash back bonus on the Rewards R Us program.